Small 50ml travel safe sunscreen. Take it with you in your carry on flight luggage, TSA compliant volume. 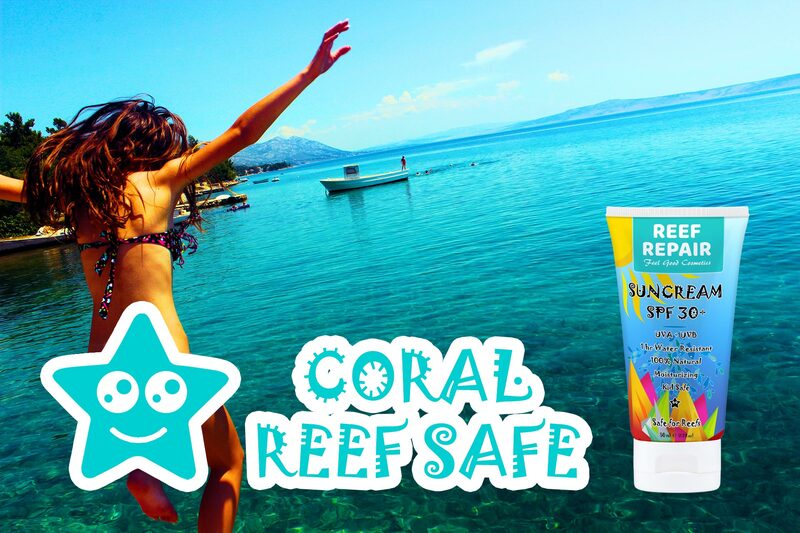 Reef Safe 100% natural moisturizing sun cream. Non oily, 80 min water resistant full UVA, UVA II and UVB broad spectrum SPF 30+ protection in travel friendly 50ml bottle with easy to use snap cap. Fast and reliable worldwide shipping via Amazon! 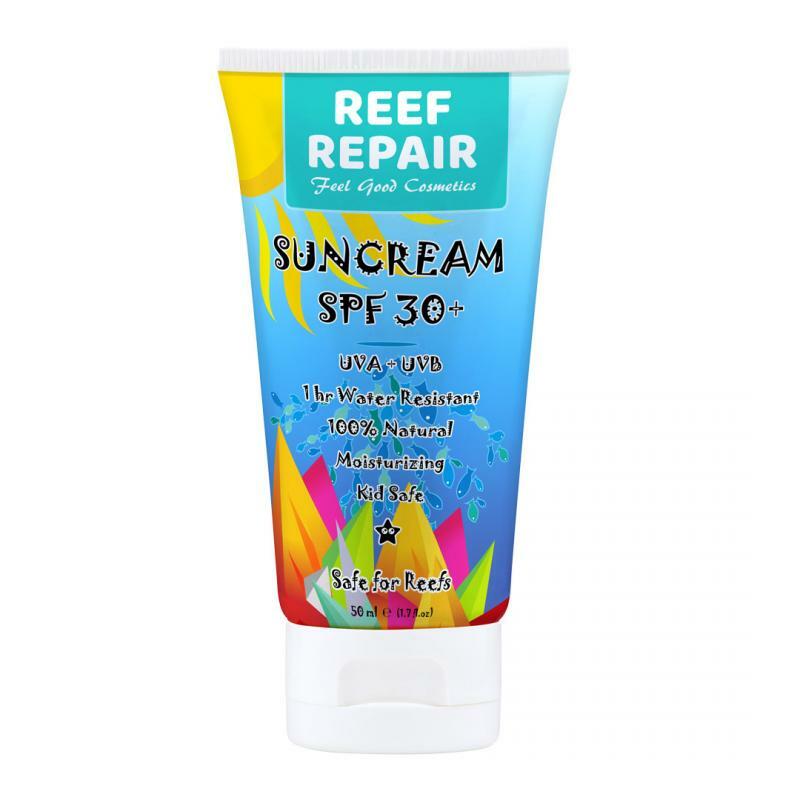 Reef Repair reef safe SPF 30+ 50ml sunscreen is a great travel companion for any holiday whether warm, wet or cold. At just 50ml in size it makes for an easy to carry on luggage item that will be ready when and where you need it even if you travel light. Get a trusted all natural, broad spectrum, moisturizing, kid safe sunscreen that won’t let you down! Help protect coral reefs around the world by ditching toxic chemical sunscreen. Go natural with Reef Repair sun care products and protect the environment as well as your skin from the harmful effects of too much sun. … made from only the finest quality 100% natural ingredients and minerals. Protect your skin from the damaging effects of the sun and keep your skin healthy and looking young. The 50ml travel friendly Reef Repair reef safe sunscreen bottle is 100% TSA approved, can be taken with you in your carry on flight luggage. 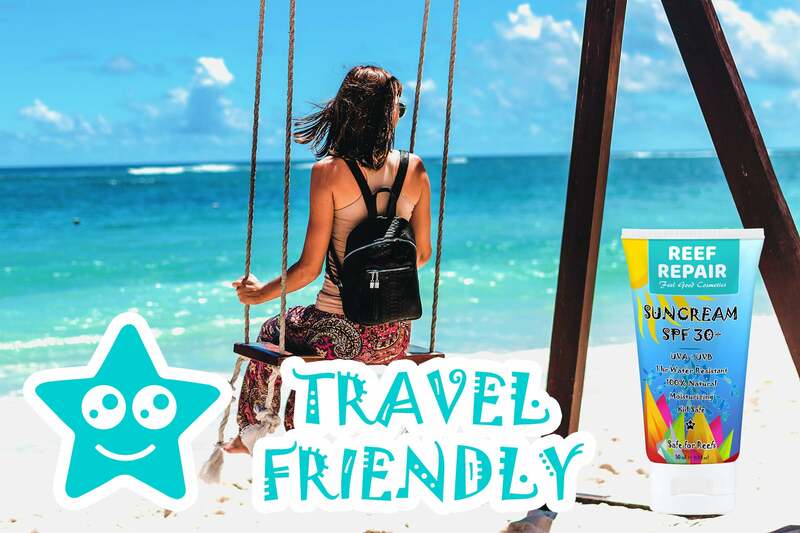 If you are traveling light to somewhere sunny that requires the use of reef friendly sun cream such as Hawaii, Mexico, Maldives, Belize, Great Barrier Reef or Thailand, than make sure you have a travel friendly reef safe, all natural SPF 30+ sunscreen. All Reef Repair sun care products and sunscreen’s are broad spectrum meaning that they block UVA, UVA II and UVB radiation. This products SPF 30+ rating protects you from 97% of the suns harmful and damaging rays. 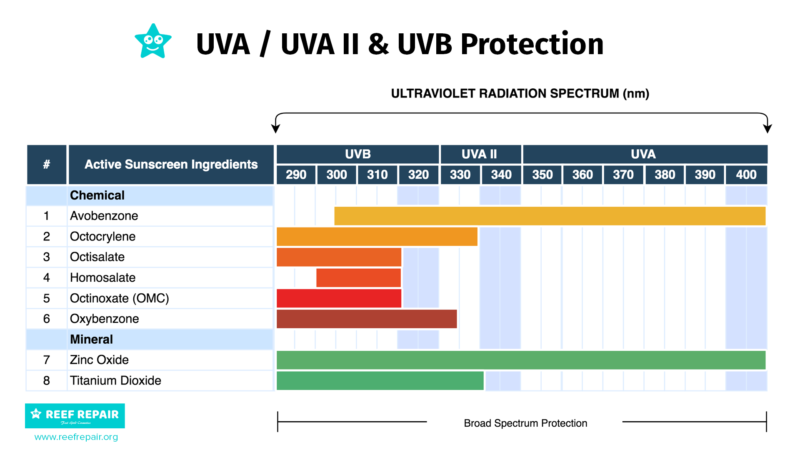 Protect yourself and your family from skin cancer, wrinkles, premature aging and irreversible DNA damage with an ultra effective sunscreen that nourishes your skin while helping keep you and the environment safe from harm. Reef Repair sun care products are 100% child and baby safe. 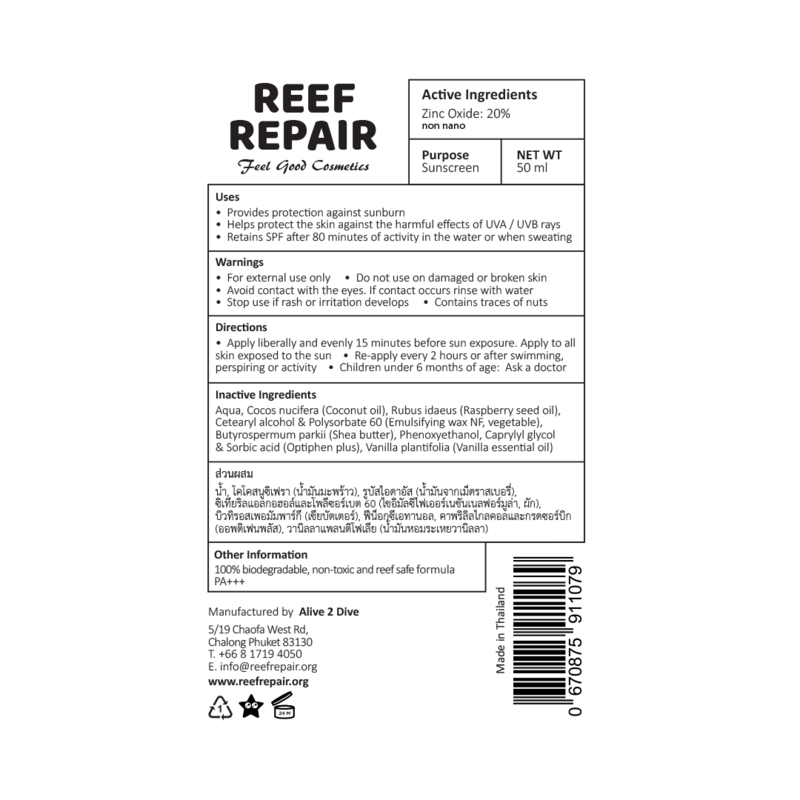 In fact kids love Reef Repair because it’s so easy to apply, even better than that Reef Repair sunscreens contain no harmful chemicals, toxins or parabens that can irritate sensitive skin types. 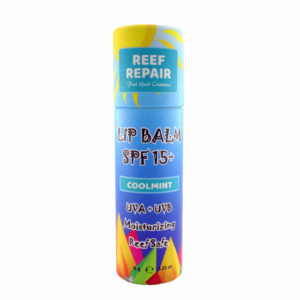 Reef Repair sunscreens are also moisturizing and completely non sticky, non whitening and non oily. Maybe best of all they go on easy and rub in quickly. You won’t be left looking like someone attacked you with White paint after using Reef Repair reef safe sunscreen. Don’t waste money on other products that will paint you white, refuse to rub in or that your kids will hate putting on, purchase Reef Repair sunscreen to be assured of a cream that protects your skin and applies easily. Stay safe in the water as well as on the beaches. Swim, surf, snorkel, dive and play on your holiday without fear of your sunscreen washing off immediately in the water and letting you burn. Reef Repair sun care products are up to 80 minutes water resistant. 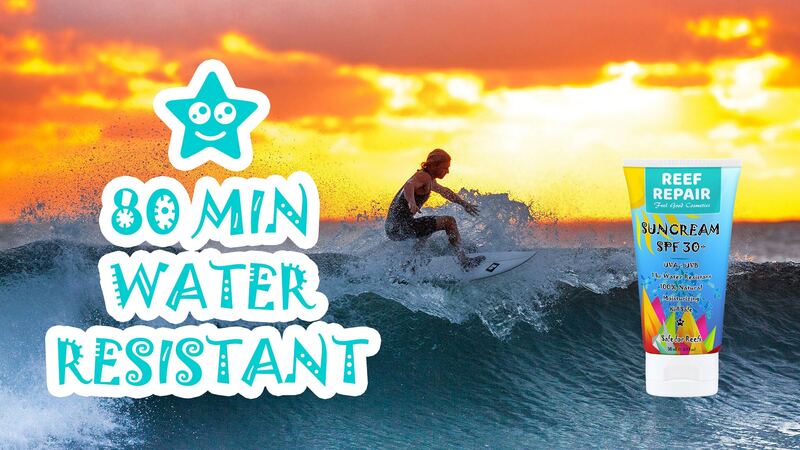 Just remember you need to re-apply after every swim, every two hours or after drying off with a towel. 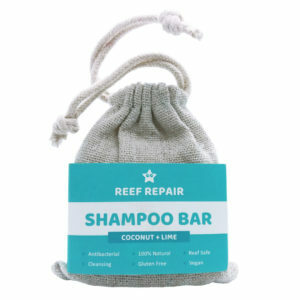 Reef Repair products are not tested on animals of any kind. We want to help protect the worlds coral reefs and to do that effectively we use only willing human beings as our product test subjects. 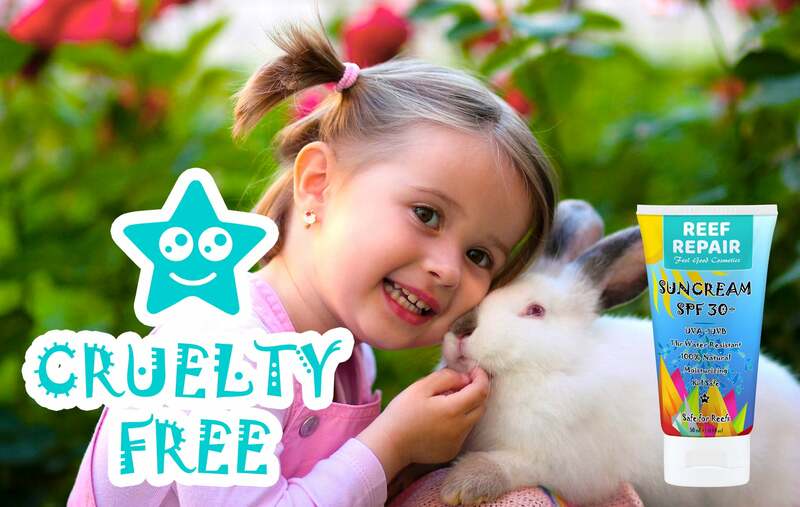 Get a sunscreen that doesn’t harm coral reef, Monkeys, Bunnies or Guinea Pigs. 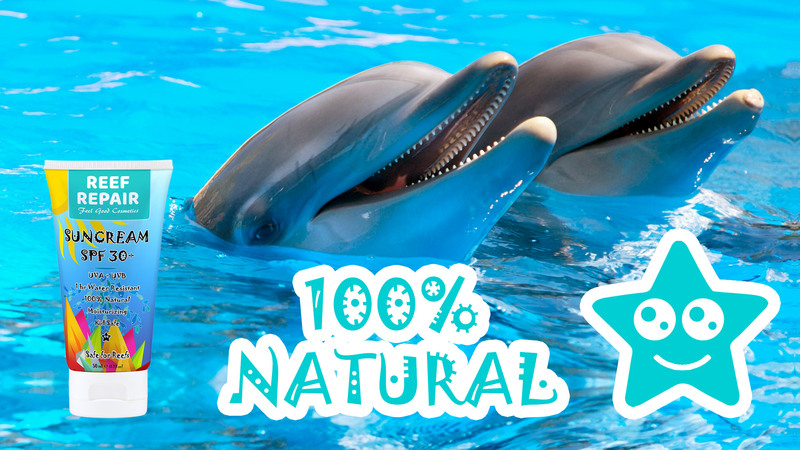 All Reef Repair sun care products are 100% natural made with only the finest ingredients. Our quality control mechanism’s ensure that nothing synthetic enters our bottles so you can be assured that you are not harming the environment or your families health and well being. 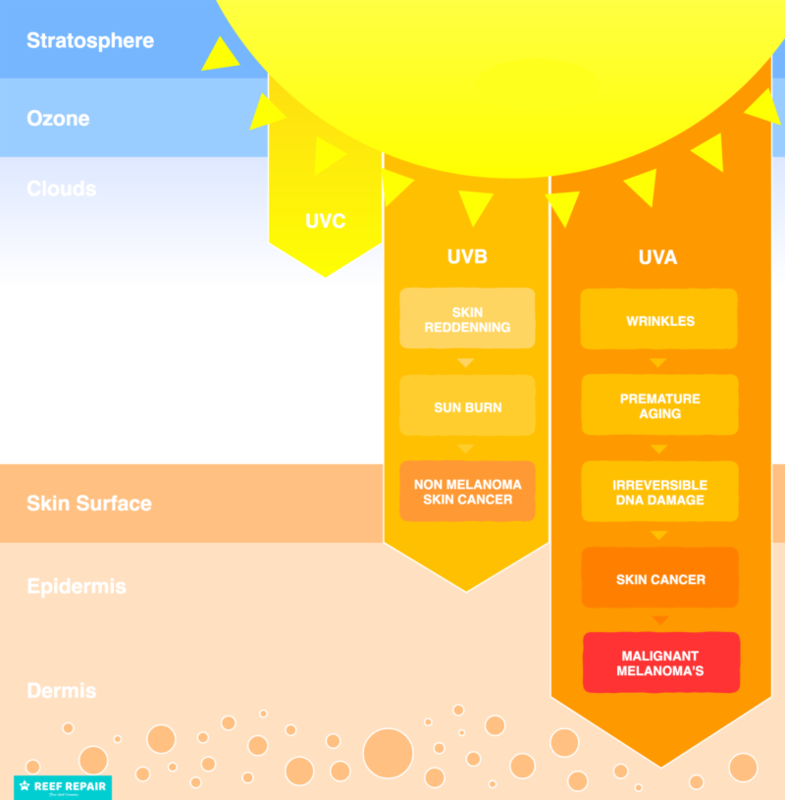 Stay away from toxic chemical sunscreen and start using an effective all natural SPF 30+ sunscreen. 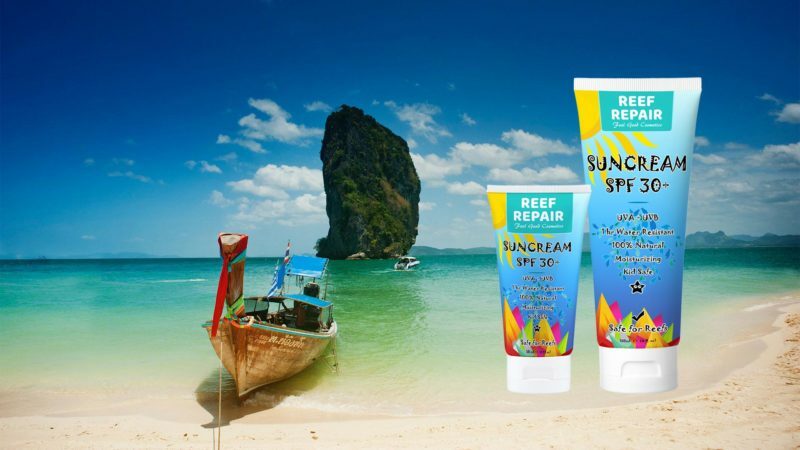 All Reef Repair products are made exclusively in Thailand. Our ingredients are sourced here from local suppliers and we endevour to keep our products hand made and synthetic chemical free. We also offer free shipping in Thailand on all of our reef safe sunscreen, lip, skin and hair care products. Join the Reef Repair sun & skin care revolution today and protect our coral reefs for tomorrow. Do you have SPF 50 sun cream? Is this sunscreen safe for my kids? Can I use this sun cream in Hawaii & Mexico? 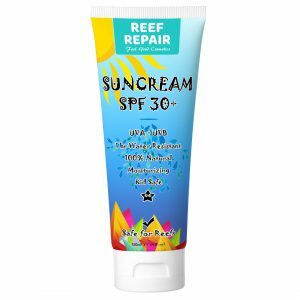 Reef Repair does not make SPF 50 products. An SPF 50 sunscreen only provides 1% better protection than our SPF 30+ sunscreens. Find out the truth behind SPF ratings. All Reef Repair products are 100% kid safe. 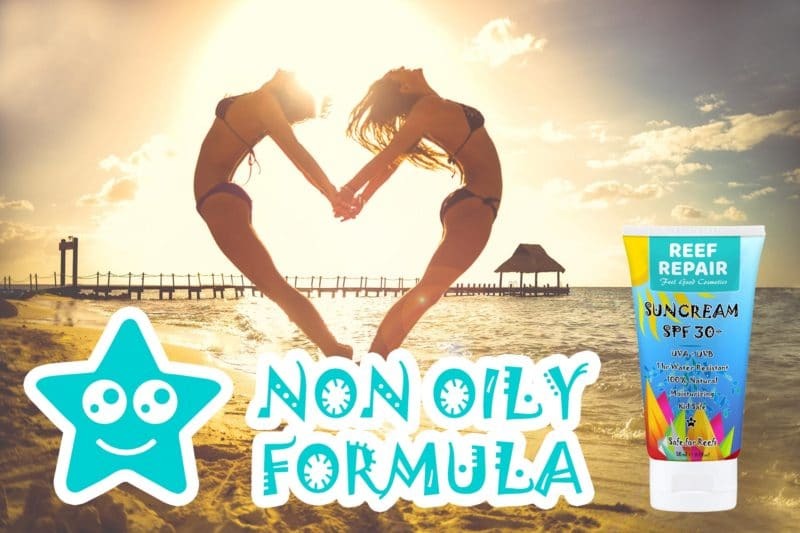 We use 100% natural minerals & ingredients that are backed by strong science and years of testing to ensure that even children with the most sensitive of skin will love using our sun creams. Is this sunscreen water resistant? This product is extremely water resistant and will provide up to 80 minutes of sun protection while swimming or visiting the beach. You must still re-apply every two hours and/or after using a towel or any vigorous activity that causes heavy sweating. Reef Repair sun cream is a certified 100% all natural sunscreen, it can be used anywhere, anytime, including both Hawaii & Mexico, as well as The Maldives, Belize, The Great Barrier Reef, Indonesia and Thailand. If all conditions are not met, Reef Repair reserves the right to refuse your return. Pack all items that you would like to be returned securely and post via registered mail with tracking info as we are not liable for shipments which may go missing during transit. Once we receive and inspect your item(s), we will issue your refund in the same way you made the original purchase, please allow up to 30 days for the credit to appear on your statement. For Returns, Refunds or Exchanges please email . How can I contact Reef Repair? Will my products be packaged and delivered safely? Where does Reef Repair deliver to? What are your retail shipping charges? What are your wholesale shipping charges? Are there any additional duties/custom tax charges? If I order on a Sunday when will my order be shipped? Can I change my order once is has been placed? Which product/service is right for me? If I am not satisfied with my product can I return it for a full refund? You can contact us by email on or by phone on +66(0) 8 1719 4050, we will be happy to answer any questions you have. Yes, we pack and label all our products to ensure an easy and safe delivery. We take good care to pack so that no damage will be done during transit, however that can never be 100% guaranteed once the shipping is out of our hands, please see our returns policy if any damage has occurred. We try to process all the orders as soon as we have received payment, however please allow up to 5 business days for the order to be processed and shipped based on volume of incoming orders. We deliver to most places worldwide, there may be some countries we cannot deliver to, you will be notified when you set your address on the checkout page if your country can recieve Reef Repair products, alternatively you can contact us on , or phone on +66(0) 8 171 94010. Our shipping charges are calculated based on the country, weight and amount of the product you have ordered. All shipping charges for retail orders are included on the checkout page. Retail orders are shipped through amazon.com, Amazon use their own shipping couriers and have their own policy for international orders, they may even refuse delivery to your country if the country is known to apply illegal import taxes and customs duties. Wholesale shipping orders may require Reef Repair to contact you with an estimate of the international shipping charges for you to agree to. Wholesale orders within Thailand can be shipped with either EMS or DHL; all international orders are shipped via DHL, UPS or FEDEX. Depending on the country, for international orders there may be additional customs and import taxes imposed at the receivers end, Reef Repair is not liable for any of these costs. We try to process and ship the orders as soon as the payment has been received, if ordered on a Sunday this would be the next business day, however in busy times please allow up to 5 business days for the order to be shipped due to large order volume. At the moment we are only able to offer next day delivery in the US through amazon.com as priority next day shipping, please see shipping policy for amazon.com. We are unable to offer next day delivery on wholesale packs. Yes, if your order has not yet been processed and shipped then you can cancel at any time, please contact us, quoting your order reference number, as soon as you can to cancel your order on +66(0) 8 171 94010 or via email on . If your order has already been shipped then please see our returns policy. Please contact us as soon as possible on +66(0) 8 171 94010 or via email on , to change your order quoting your order reference number. Unfortunately, we are unable to offer same day delivery. Yes, once your order has been shipped we will email your order details with the courier service and tracking number for your goods. We have 2 payment gateways, either via credit card or PayPal at the online check out. Reef Repair does not store your credit card details and all payments are secured via Stripe payment gateway or PayPal. If you are a customer looking to purchase for personal use you can buy directly from us in our fast & secure reef safe sun care products shop, you can also find our retail products on Amazon. If you are a retailer looking to buy wholesale then you will need to register an account with us, this does not take very long and once you have done so then you can make repeat purchases easily and quickly. Yes, we use many different physical and electronic measures to ensure all your information is secure; and that it is not misused, stolen or lost. We do not store any credit card details, all payment information pertaining to credit cards or PayPal is stored with the payment provider. Reef Repair reserves the right to store purchase and personal information to your Reef Repair account when you are a registered customer or retailer. You can return your product within 30 days of receipt. Please see our returns policy for the conditions and eligibility of return.